On August 12, 1898, during ceremonies at ‘Iolani Palace, two figures stood on a platform before an international gathering. Sanford B. Dole and U.S. Minister Harold Sewall exchanged treaty ratifications annexing the Hawaiian Islands to the United States. Or so it appeared. But was it really a treaty of annexation? And did Hawai’i really become a territory of the United States? 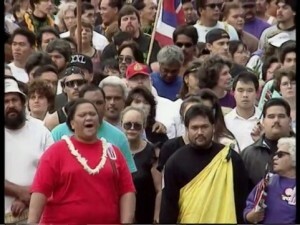 This short program – a must see for any student of the Hawaiian sovereignty issue – tells the story of the defeat of a treaty of annexation by Queen Lili’uokalani and loyal subjects of the Hawaiian Kingdom, who sent an anti-annexation petition to Congress in 1897 consisting of over 38,000 signatures representing 95 percent of the native Hawaiian population. 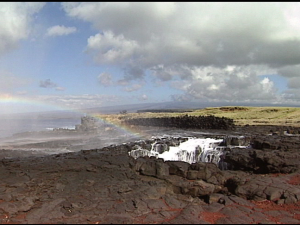 A co-production of the Hawaiian Patriotic League and Na Maka o ka ‘Aina, the video was part of a public education campaign to increase awareness of Hawaiian history and sovereignty during the 1998 centennial of the purported annexation. Aloha, I’ve down a quick fix of the link for the video. 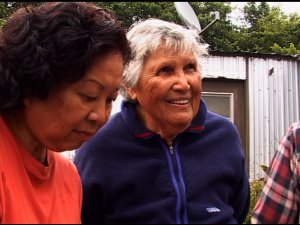 E kala mai, we are still going through our back log of posts and looking for any issues since moving to our new website. Mahalo for your patience! Video not popping up. Fix please? Unfortunately the video is still not available. Kaipo, you mentioned a “quick fix”. Is there another link we can use? Mahalo for fixing the link Kaipo.